“The Keeper of Secrets” is as a Regency novel with a difference. In this book, Judith Cutler has successfully combined the dark world of crime writing with an era that we perceive as being almost universally polite, delicate and graceful. The Regency period is, after all, the world that Jane Austen inhabited. The result is an unusual novel that is an interesting combination of historical mystery and social comment that shows the bleaker side of this undoubtedly elegant period. It is 1810, and the rural backwaters of Moreton St Jude, Warwickshire, are about to get a rude awakening in the form of the new parson, Tobias Campion. Young and freshly out of Cambridge University, Tobias marks himself as very different from previous incumbents on his first night in the village, standing up for housemaid Lizzie Woodman’s honour when a drunken guest of local aristocrat Lady Elham (“a distant but generous cousin of my mother”) attempts to molest her. Coming from a background of privilege and comfort, the culture shock of his small vicarage and suddenly being without an army of servants to flatter his every whim for the first time makes Tobias suddenly see how the other half live. Attending the poor in their hovels acts as a further catalyst to make the young man want to help where he can, and he continues to shake things up in his parish by trying to keep the poor out of the workhouse, teaching servants read and write, and preaching to the wealthy in his congregation about their moral duties to help those less well off. As the younger son of an upper class family and the distant kinsman of an unimpressed Lady Elham, this is somewhat unorthodox behaviour, to say the least. While his efforts are appreciated by the many villagers trapped in grinding poverty and under the constant worry of ending up in the workhouse, his “betters” seems less pleased with his work. Tobias is shoved and shouted at by Lady Elham’s son, shown little respect by the middle class artisans in his congregation, and even once finds rope strung across a path intended to trip his horse up. Despite such un-gentlemanly behaviour by some local residents, Tobias finds himself settling in and forming friendships within the local community. He begins to enjoy walking in the woodlands surrounding his new home, taking an interest in ornithology, and even finding time to entertain the idea of romance. However, it soon becomes clear to him that there is more not right with Moreton St Jude than poverty, ignorance and rude behaviour. A poacher dies in agony from a man-trap; Lord Elham mysteriously drowns in the river while out walking with his wife; the heir to the title has a reputation for cruelty that none of his mother’s fondness can abate, and Tobias himself is attacked while walking home one evening, leaving him unconscious and robbed of his boots, watch and money. Malign forces seem to be at work in his parish, and cause the parson grave concern. Matters come to a head when Lizzie disappears from her employers, leaving Tobias and other admirers of the beautiful girl to wonder what had become of her. In the absence of a local constable, it is up to the two most educated men in the village – Tobias and the local physician Edmund Hansard – to investigate what has happened to her. The blurb on the back of the book describes it as a “gothic thriller”. Certainly, it had both the elements of horror and romance in it that would qualify the gothic tag, but I certainly didn’t find “thriller” to be an apt description of “The Keeper of Secrets“; to be a thriller, surely there needs to be fast pacing and regular action at the very least? The novel, however, takes a long time to get moving, and it takes well over a hundred pages of scene-setting and build-up before the pivotal event occurs and Campion and Hansard can begin their mystery-solving exploits. While this process is beautifully written and absorbing, there is a curious lack of urgency in most of the first half of the book to actually get anywhere; this is partly due to a lot of the action taking place off-stage and being narrated after the fact by letters. I have read other reviewers criticise Cutler for taking this slow approach with her plot, but I disagree. Firstly, the large amount of background information you are provided with gives events later on in the book more impact when you do reach them, as you are by then acquainted with the characters and their lives. Like Tobias, you have become familiar with Moreton St Jude through this process, and events are all the more shocking by their happening to people you have started to feel you know. Secondly, this approach very much reflects the era. In 1810, things happened far more slowly than they did today, and people would have learnt much of what happens away from their home by letters arriving long after things had happened. This isn’t “CSI”, but people more familiar with crime fiction from such programmes may find it frustrating when there isn’t a big, attention-grabbing event right at the start of proceedings and they have to be a bit more patient. Tobias Campion is an intriguing central character to this story, strong on responses to people’s needs if less concerned with theological issues than his calling would suggest he should be. It is through him that we as readers learn of the poverty and hardship that many people suffered two hundred years ago in what would have been a wealthy country, and it is hard not to be as shocked as he clearly is. 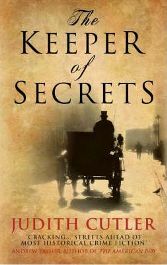 “The Keeper of Secrets” is in many ways like the nineteenth century social novel in this regard, showing the deplorable conditions of farm labourers’ houses, workhouses and jails, and the lack of protection women and children suffered when husbands and fathers became sick or died. Tobias is unusual both in being a generous and humble member of the upper classes, and in his desire to help the people he meets, although his character is rounded by the obvious difficulty he has in dealing with extreme poverty when he first encounters it. I would like to have seen one or two other little niggles or flaws to truly make him a believable character rather than a sainted noble who is always in the moral right, but nonetheless I took to him and found Tobias an interesting man to read about. The period atmosphere in the novel is well captured, and seems mostly well researched. I say “mostly” because while there was rich and fascinating historical detail scattered throughout the story, other parts made me raise an eyebrow slightly. A couple of points I did wonder at were the enthusiastic descriptions of Christmas in an era when it was unfashionable and not widely celebrated, and the mention of “Bath Cathedral” rather than “Bath Abbey”, which is a slip that probably should have been picked up by an editor. None of these detracted from my enjoyment of the novel as a whole, however, and the use of language by Cutler, which made the book feel like it was written in and not just about the nineteenth century, more than made up for these hiccups. I liked the way that words of the period were dropped into the text, and not just in the dialogue; I especially liked “nuncheon” (meaning a light meal, the forerunner of “luncheon”) and the way that period insults were thrown about, “vile mushroom” being a wonderful description of an unpleasant woman that I must remember. In summary, Cutler has given us a lively and entertaining novel that will appeal to audiences of both historical fiction and mystery novels. Liking both genres, I enjoyed this work immensely, and appreciated the unusual setting that this book provided. This perspective of the Regency period, and realising how difficult any sort of detection would be in a world without modern technology and where social boundaries inhibit your ability to interview potential witnesses, made for a thoroughly interesting plot. I liked Tobias Campion, and look forward to reading of his other exploits – one more book featuring him has already been published, and I do hope there are more to follow. No Comments on "The Keeper of Secrets"